What’s going on, here? Is this some sort of undead Bizarro world? News recently broke that Austin Amelio will return as Dwight for Fear The Walking Dead‘s Season 5. Does this officially mean that the series is nothing more than a collection of cast-offs from the more popular series? And could Sherry be far behind? Fans who had stuck with the show for three subpar seasons were experiencing some unrest when two of the original cast members were killed off last season. Kim Dickens’ Madison and Frank Dillane’s Nick were a powerful mother-son combo on the show, but they were also part of the problem. Individually, their storylines were lacking (as with their acting, at times), but whenever they teamed up, they generally proved to be a powerful team. Too bad past showrunners kept breaking them up, slowing the show’s momentum in the process. But just as Fear was finally gaining some momentum after last season’s rocky rebuild, there’s more crossover characters on the horizon. Sure, bringing Morgan Jones over to the sister show was a smart and savvy idea by new showrunners Andrew Chambliss and Ian Goldberg, but continuing the trend into year two of their reboot feels unnecessary and just like a cop-out. In addition to bringing Lennie James into the picture, Garret Dillahunt’s John Dorie stole every scene he was in (although underused) and the one-two combo of Jenna Elfman’s June and Maggie Grace’s Althea brought a lot of much-needed energy to the show. And while Morgan is GREAT as a supporting character, he’s less interesting as the series’ main protagonist. So, why don’t we shake it all up once more and hope to get something better by adding yet another well-known character? Last year felt like a blur for The Walking Dead (which was ALSO getting a soft reboot), so it’s no wonder I couldn’t remember if Dwight had even appeared in Season 9 at all (he was written out of the whole season). It makes sense that he finally shows up in a storyline, somewhere, even if Amelio’s character didn’t get to live up to his character’s comics origins. But where’s he been? Is he still looking for Sherry? Or is he still simply fleeing from Negan, trying to get far, far away from The Saviors? Lennie James, as Morgan, was the first to crossover, which brought over higher ratings with him. 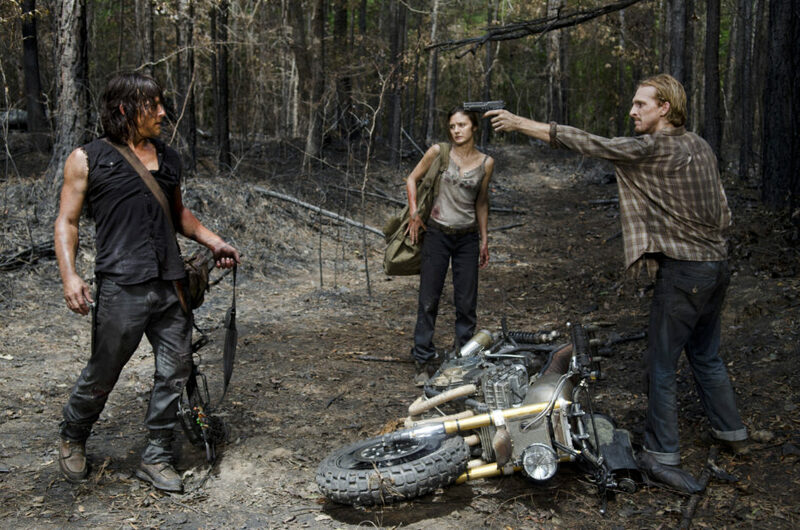 How will his character react to Negan’s right-hand man showing up? Does this mean Negan might be the next one to arrive, once he’s either expelled from TWD or left for dead, yet again? While I fully support this decision by the showrunners, the sister series still feels like it’s getting scraps from the dinner table, while last season was the best one so far in terms of writing and acting. The new characters have really gained traction and while there’s a very vocal portion of the show’s population who won’t support the new direction for the series and killing off the original cast, both new showrunners have really promoted creative growth to what was previously perceived as sub-par entertainment. For a while I foresaw Fear fading into oblivion, while TWD kept growing record-setting ratings. Somehow, Fear found a way and TWD is still surviving, somehow. But if Fear‘s going to grow its audience for another season, specifically, and the Walking Dead Universe at large, it HAS to be more than just a collection of crossover characters and storylines!